Yay! Another amazing "restaurant" salad. And it's so simple! 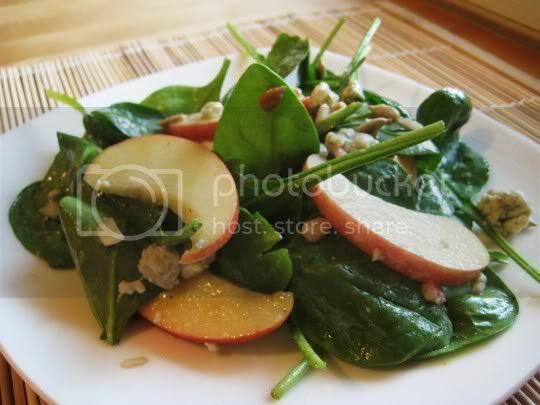 Baby spinach, apples, sunflower seeds, and blue cheese are tossed with a tangy honey-mustard vinaigrette. That spinach-y taste is masked by the other flavors, so it serves as your basic salad green. I used Fuji apples, which are crisp, mildly sweet, and juicy. The sunflower seeds are toasted to add a nutty, fragrant aroma and nice crunch. And if you're not a blue cheese fan (the amount called for in the recipe can get rich rather quickly, so use sparingly), you can easily substitute another stinky cheese (Gorgonzola, Roquefort, etc.) or maybe even a nice goat cheese. But whatever your cheese choice, it's a perfect complement to the tangy-sweet vinaigrette. Apple cider vinegar for the tang, Dijon mustard for the bite, and honey for the sweetener. Shallots added a slight onion-y flavor, and olive oil gave the spinach leaves a nice even coat. I probably was done preparing this in about 10 minutes, so it's a must for quick side dishes or appetizers! Make again? Definitely. I plan on eating one of these all week!